I'm always amazed when someone can combine the most functional green tech with a stunning design. 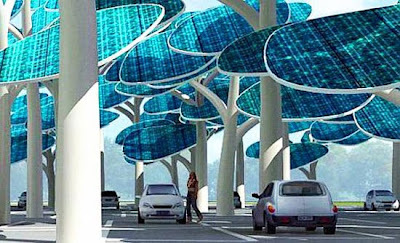 Architect Neville Mars has designed a concept for a charging station which uses oversized solar panels, shaped as giant lilypad-trees. Wouldn't it be incredibly inspiring to park under these or even just see them? They would cut such a striking figure in the urban landscape, shaming all of us drivers of gas-powered vehicles, and serving as a visual reminder to us all that we need to love and protect our world.